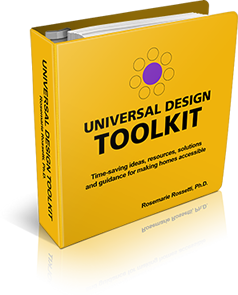 As I speak around the country about universal design housing, members of my audience composed of interior designers, architects, builders and consumers ask many questions. It has occurred to me over the past several years that there are many misconceptions about universal design. Let me share a few of the top myths and explain reality from my perspective. Myth: A home using universal design looks ugly, institutional and stereotypes the home so people know it was designed for a person with a disability. Reality: Professionally designed homes with universal design features and products enhance the beauty of a home while making it functional for people with disabilities, as well as convenient for people without disabilities. Universal design is for everyone, not just people with disabilities. There are many beautiful noninstitutional looking universal design products, such as grab bars, in the marketplace. Much of a home’s beauty comes from the finishes of the plumbing fixtures, appliances, hardware, cabinets, countertops, wall treatment, and flooring. Universal design products are available in these beautiful finishes. Myth: Universal design costs more due to the building design and products with universal design features, such as windows, appliances and plumbing fixtures. 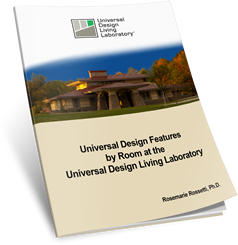 Reality: My experience building my own home, the Universal Design Living Laboratory (www.udll. com), national demonstration home in Columbus, Ohio, has shown that there are many choices when it comes to selecting products for the home. Those with universal design features are not more expensive as a general rule. In fact by adding design features and products that support universal design, the home will have more value to the occupants because it will be more usable for a lifetime. Myth: Universal design takes more square footage. Reality: Space planning is critical in home design especially when the homeowner uses a wheelchair. As a person who uses a wheelchair, I am very cognizant of where extra space is needed and how to be conservative with space planning when creating a floor plan. By creating an open plan with fewer hallways, square footage can be conserved. By putting adequate space in the kitchen and bathrooms, there will be a lot more accessibility, comfort, and convenience. A universal design home need not have additional square footage, but rather have adequate room for a person to navigate the home from a wheelchair. Myth: The resale value of the home will be less due to limiting the number of buyers who would be interested in these universal design features. Reality: Universal design is for people of all ages and abilities. As the US population gets older, especially the baby boomers, they will be remaining in their homes longer. Many are opting to renovate their homes, and others are choosing additions to help them to age in place. Some are purchasing new homes of a smaller size than their last home. They are looking for all the features and comforts to be able to maintain their independence and stay in their homes for the rest of their lifetimes. Universal design features provide for safety and add value to a home. Myth: The Americans with Disabilities Act has so many regulations that are very complicated to follow when designing homes with universal design features. Reality: The ADA does not apply to single family housing unless federal funding was utilized. Private homeowners do not have ADA laws to follow. Myth: The builder and their subcontractors are used to doing it their way and will not follow my design properly to include universal design features. It’s too hard to change their building process. Reality: Builders are becoming certified through the National Association of Home Builders in the Certified Aging in Place Specialist program and are learning how to utilize universal design principles. Builders are insisting that their subcontractors read the plans and follow the procedures for building new homes. As products are ordered by the builder, the universal design features are already a part of the design. As builders construct more homes with universal design features, universal design will become the new standard in the building industry. Myth: A home containing universal design features will be harder to pass a building code inspection. Reality: By the very nature and definition of universal design, there are no practices that go against federal and state building codes. There are also provisions for local variances should a question arise in the plan review stage. Myth: Universal design homes have ramps at the front door causing the home to be labeled as a home for a person with a disability. Reality: In order to create a no step entrance, there are some instances where a ramp at the front door is the only solution. However, by modifying the grade around the home, there are many properties that can be designed with a no step entrance. If ramping is needed elsewhere, such as in the garage, side door, or rear door, the ramp is not visible from the street. Myth: Universal design is restricted to building a ranch style home. Reality: First floor living is the goal for universal design, however, multilevel homes can also be constructed with provisions for access to the upper and lower floors by way of elevators, platform lifts and stair lifts. Myth: Only a small number of people with disabilities and the elderly will benefit from universal design. Reality: Universal design is human-centered design. The inclusive design of spaces and products will benefit people of all ages, with or without physical or mental limitations. No one can predict when a short term or long term disability will be a part of our lives. It is far better to plan for homes to accommodate us as we age rather than to be forced out of our homes when circumstances change.